and a tripe shop at the end of Market Street! Westbourne House, at the corner of Bridge Gate and West End (now part of Hebden Bridge Tourist Information Centre), was the doctors surgery. The ones I remember were Drs Brown and Gillies. The waiting room, consulting room and dispensary were on the ground floor. In those days all the doctors made up all their own cough and cold remedies etc, which were wrapped up in white paper and left for you to collect later on in the day. Next door was Thos. K. Hey Chemists, afterwards Timothy White and Taylor, then Boots. Then came the Yorkshire Penny Bank, now the Yorkshire Bank, where we used to take our threepenny bits every Monday. I still have my bank book for King George Vs Jubilee, when we were all given one shilling (5p). The premises were once a café, I understand, but not in my time. 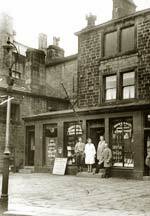 Next to the bank was the entrance to E.F. and J. Horsfall, clothing factory, underneath which was Hebden Bridge Co-operative butchery department. Then there was a pork butchers  in my early days just a wooden single-storey extension selling bacon, ham etc. 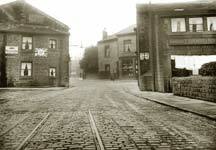 An entrance further along led to a firm selling buttons and also at the rear was the Co-op painters and decorators. A ladies hairdressers, Kathleen Wheelhouse, and barber J.W. Horsfall were next, connected by a door. We used to pay 3d or 6d for a haircut (approximately 1p and 2p) and men would come in for a shave, always with a cut-throat razor; some had their own shaving mug which they kept at the barbers. Then came Marshalls Electricians, forerunner of Marshalls Engineers, Mytholmroyd, and a drapers and childrenswear shop kept by Mr Marshall senior, which eventually became Hazels. These buildings were all demolished in the 1960s to make way for Bridge Gate car park. Theres more from Lloyd, including the shop which sold hogskin gloves  and where you could find a steam lorry parked!